While he is not necessarily pushing the envelope at least Jason Statham continues to recognize what he does best and at the very least is always reliable. I stated in my review of Parker earlier this year that though the chrome-domed action stars choices may seem random and throw away the guy knows what he is doing and who he is working with. That seems more evident than ever with his latest as he was likely roped into it due to the fact his pal Sylvester Stallone adapted the screenplay from a Chuck Logan novel. Even as Statham and Stallone are now shooting the third entry in their Expendable series and Statham will be joining another of the biggest action franchises on the planet next year, they made time to make this piece of Americana flick that will debut around an American holiday that will have families together and people in the mood to sit back and enjoy a nice piece of action fluff that includes several recognizable faces. These guys know their game and they play it well while giving us a story of a dad and his daughter who move to a quiet town that seems to have a dirty secret. The twist on Statham's character this time around is that he is a DEA agent and this supposed quiet little town has a drug problem headed up by a guy known as Gator (James Franco). When Statham's daughter picks a fight with a kid who has a drugged out mommy in the form of Kate Bosworth she apparently sets off a firestorm that pits Gator against her father who is only more enraged to find out Phil Broker (Statham) is undercover. Sounds rather run of the mill and I can appreciate that, but I have no doubt this will be a passable time at the theater with director Gary Fleder (Runaway Jury, Kiss the Girls) at the helm and plenty of support behind and in front of the camera that seem to really believe in the project. 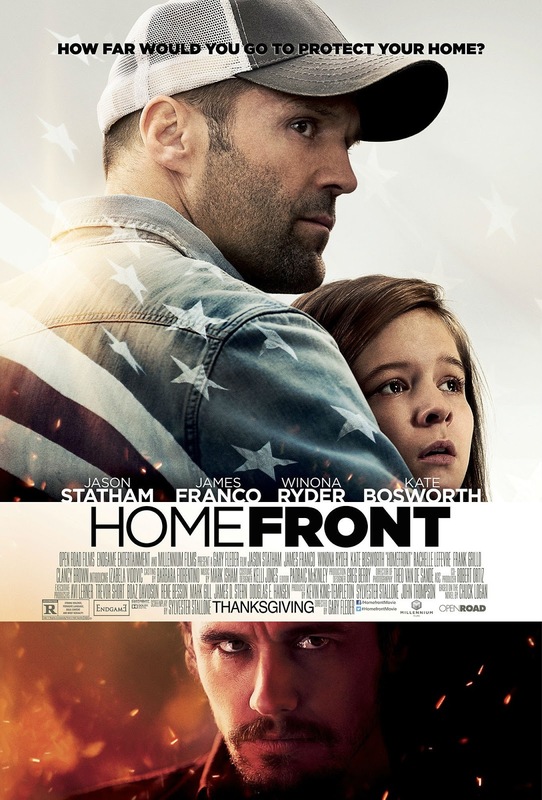 Homefront also stars Winona Ryder, Rachelle Lafevre, Clancy Brown, Omar Benson Miller, Frank Grillo and opens on November 27th. Hit the jump to check out the first trailer now.